It’s been a while since we were in touch, so it’s about time for an update on the SHIFT project. Since the last time you heard from us, change has been afoot. Since the departure of one of our core team members things have been difficult, and our capacity has been reduced. A few months ago we lost our web developer/admin, and subsequently our web platform. His sudden decision to leave the team was accepted by all, but unfortunately there were some unresolved grievances that caused some lengthy downtime for us all. SHIFT is now reincarnated, not resurrected, in a different form. We no longer have the capacity for a really snazzy website or glossy print magazine, so we are both shifting and downshifting the project. 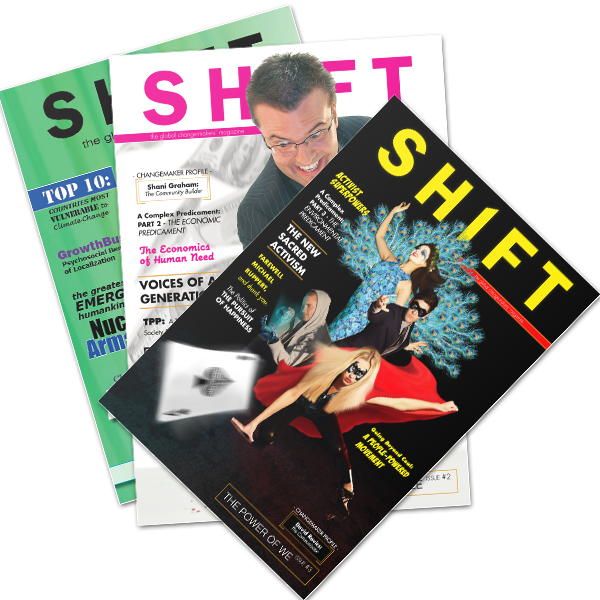 SHIFT’s new web platform has shifted location to www.shift-magazine.net, a site that is nowhere near as pretty as our previous platform, but serves the function of continuing to share information, inspiration and empowerment with our readers. As we are no longer in print, SHIFT has downshifted to an online-only publication. With this change in form, we will now be publishing material more frequently. All of our back issues are available on our new site in pdf form, which you can download free of charge. Please feel free to share these – and any articles that grab you – elsewhere with appropriate attribution (simply link to the original on this site). If you’re one of our paid subscribers and would like to discuss your subscription, please contact us via: shiftmagazine.net@gmail.com, and we’ll get back to you as soon as we are able to. Thank you for your patience, and for being a part of the SHIFT.